we are using Mango 2.8.8 to read a BACnet device. We noticed we are having issues reading the devices from Mango when we do a BACnet who is look up. 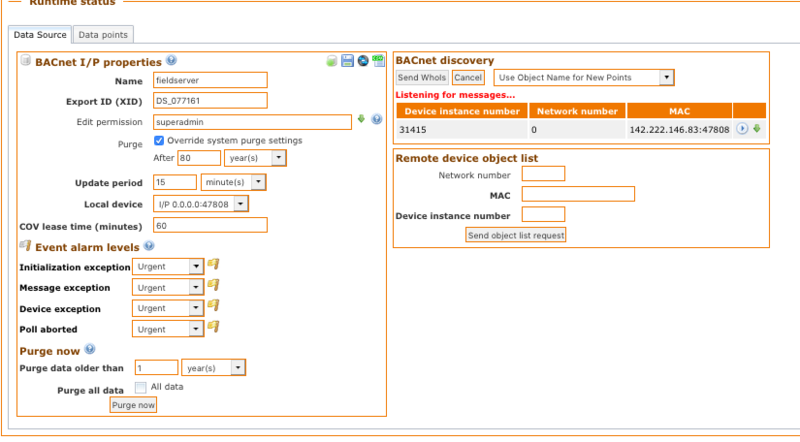 When we spoke to the manufacturer of the BACnet device they told us to add the BACnet device as a foreign device on Mango--Mango has to send the who is request directly to the router on a specific IP address. How can this be done on the system settings for a bacnet data source? You could probably also send the WhoIS to just that device by changing the broadcast address to that device's address in your Local device settings on the system settings page. That wouldn't quite be the same as sending a foreign device registration explicitly, though.